I have seen too many wounded women. I have watched them lose the light in their eyes when the shadows overcame them. I have heard a thousand reasons why they no longer give themselves permission to live truthfully. I have seen too many wild hearts tamed. I have witnessed the loss of courage when it’s just too hard to keep being an edgewalker in a world that values conformists. I’ve recognized the fear as they take tiny brave steps, hoping and praying the direction is right. So much woundedness has been laid tenderly on the ground at my feet. So many women want their stories validated. Their fears held gently. Their tiny bits of courage honoured. I hear them whisper “please hear me” through clenched teeth. I see the tears threaten to overflow out of stoic eyes. I feel the ache of silenced dreams. They come to me because they know I have been broken too. They trust me with their whispers because I am acquainted with fear. They look to me for courage and understanding because they witness my own long and painful journey back to my wild heart. You can be wild again. You can trust your heart. She will not lie to you. You can live more fully in your body. She will welcome you back. You can go home to that part of you that feels like it’s been lost. You can find a circle of people who will understand you. You can step back into courage. You have permission to be an edgewalker. You have permission to speak the things that you’re longing to say. You have permission to be truly yourself. You have permission to step away from your responsibilities for awhile. You have permission to wander in the woods. You also have permission to be afraid. And to wait for the right time. And to sit quietly while you build up your courage. You don’t need to do this all alone. And you don’t need to do it all at once. You don’t need to shout before you’re ready to whisper. You don’t need to dance before you’ve tried simply swaying to the music. You can give your woundedness time to heal. Take a small step back into your self. Move a little closer to your wild heart. Pause and touch the wounded places in you. Just breathe… slowly and deeply. And when you’re ready, we can do this together. 1. Join me as I host a circle of amazing women at A Day Retreat for Women of Courage in Winnipeg on October 20th. Pay what you can. 2. I’m creating a new online program called Lead with Your Wild Heart (related to the themes in this post) that feels like a coming together of a thousand ideas that have filled my head in recent years. Add your name to my email list (top right) to be the first to hear about it and to receive a discount. “You also have permission to be afraid. 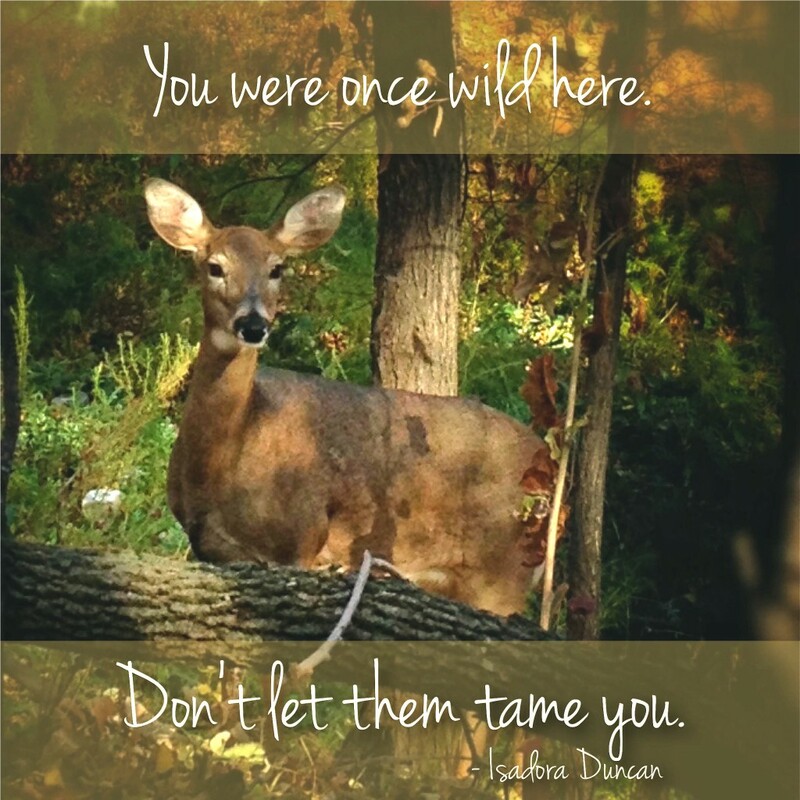 Here’s to the wildness – and celebrating that wildness – in women! I love this! I have a longing t reconnect with my wildness, that sometimes seems so buried inside that I can’t name it anymore. Thanks! It is so important to understand that we don’t have to fit into a masculine oriented world or society, and that it is only us – we, ourselves – that can give ourselves permission to be like we truly are! and even more than that: that these values that we speak of here, are the ones that we have to bring to the table of society. But first find the courage in a circle of women, until the new found power inside doesn’t get hurt any more and then we can stand for what we know is valuable and true. I love this too! Thank you, thank you. Thank you all for your kind comments! May you all find your way back to your wild feminine hearts.